The San Francisco Bay Area has an agreement for installation and dismantle labor in the hotels and convention centers with the Decorators Union, Local 510. Guidelines here are quite rigid and are enforced by union stewards. Do not try to violate the union guidelines in this city. Also, note that in the San Francisco Bay Area, Local #510 imposes regulations on all contractors to hire a certain ratio of workers from their “A” list. All hotels and convention centers in the greater San Francisco Bay Area are covered by an exclusive exhibit installation and dismantle labor agreement with the Decorators Union, IUPAT Local 510. Guidelines are rigid and strict, and are enforced by union stewards. Do not try to violate the union guidelines. Note that Local 510 may require any contractor to hire a number of union members directly from the union hall. The installation or dismantling of an exhibit requiring the use of hand tools, or which takes one exhibitor more than 30 minutes, or which is greater than ten feet in width, requires the hiring of labor from IUPAT Local 510. You may hire labor directly through your choice of an exhibitor appointed contractor such as Absolute I & D or through the general contractor. Full-time exhibitor personnel may lie out and assemble products that they manufacture. However, all other material (display boards, backdrops, stands, or anything else on which a product is displayed, attached, or made part of), must be handled by a union exhibit installer. This includes installing and removing of any flooring, and the uncrating and re-crating of items using tools. Teamster Local 85 has exclusive jurisdiction over all freight brought or delivered to the show floor. The general contractor controls dock access, and may station a teamster at any entrance to enforce this regulation. Hotel personnel may deliver items to the edge of the show floor, but then must give all items to an exhibitor or a teamster for transport to the exhibit space. Teamster material handling equipment includes dollies, hand-trucks, pallet-jacks, forklifts, and genie lifts. Genie lifts, consequentially, may not be cost-effective here. One exhibitor may hand-carry his or her own materials into an exhibit facility only if such is small enough to be handled on one trip and without the use of wheels. IATSE Local 16, the Stagehands, has jurisdiction over audio/visual equipment. However, your union exhibit installer may be needed to install digital signage, and affix mounting brackets, etc., to the exhibit structure. IBEW Local 6, the Electricians, handle electrical installation, including any wiring beneath flooring. However, your exhibit installer may distribute and connect most power and lighting. In San Francisco, straight time rates are from Monday through Friday, 8am-5:00 pm. Overtime rates are incurred outside of those hours on Monday through Friday as well as all day on Saturdays, Sundays and holidays. Lunch is from 12:00 – 1:00 pm. Should a crew be required to return with less than 8 hours between shifts, the overtime rate applies. Local 510 observes nine holidays, each at the overtime rate. These include Martin Luther King Jr (mid January) and Caesar Chavez (late March to early April). Holidays are usually observed on Mondays and Fridays. 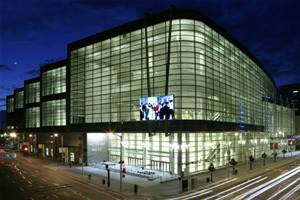 Contact us for a free quote on trade show exhibit installation and dismantle services in San Francisco.